I'm very embarrassed to admit it, but I was paying more than $60 per month for a landline provided by Verizon. I recently dissolved my relationship with Verizon and am now using T-Mobile's @ Home voice over Internet protocol (VOIP) system to make calls via my Comcast Cable broadband Internet connection, @ $9.99 per month. Unlimited local and long distance calling, call waiting, call forwarding, 3-way conferencing, caller ID and voice mail are included. I've been making moves to save money everywhere I can, and my landline was very close to the top of my list. Last week, I called Verizon to cancel my phone line, but I also wanted to hear what the company was willing to do to keep my business. We discussed trimming all the extras like call waiting, unlisted phone number, etc., but the saving were negligible. I explained to the retention department rep' that this recession has hurt my business and income in a significant way, and that I needed to cut back as much as possible. But she wasn't able to offer anything worthwhile. So I told her to cancel my phone line. I was told that my line would go dead at around 6:00 am the next morning, and it did so, right on schedule. After my line went dead, I made a few calls to certain important contacts who needed to know about my terminated landline right away. I used my cell phone, which is serviced by T-Mobile. I am on the individual Get More plan, which gives me 600 weekday minutes each month, with nights and weekends free. It costs me $39.99 per month plus taxes and fees. I'd been researching various VOIP services for some time (MagicJack, Vonage, Phone Power, etc. ), and decided to investigate T-Mobile's @ Home service first, since it seemed like the perfect fit for my situation. 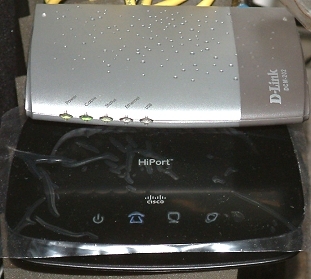 The hardware -- the Linksys (Cisco) HiPort home phone adapter (Model #URA200-TM) situated below my D-Link cable modem in the above image -- was free. Moreover, I was able to get the activation fee waived. I realized right away that the "waived activation fee" was probably just a trick to get cheapskates like me to sign on, but I was OK with it. The monthly fee for the service: $9.99. Before I signed on the dotted line, I voiced my concern that the system may not work with my home network, as I use a software router (WinGate) and I also have a wireless access point box plugged into my wired network (I use a Netgear Ethernet hub.) I use a 2.4 Ghz Belkin 802.11g Wireless Range Extender/Access point box (model# F5D7130 -- highly recommended!) so that anyone can surf the web from any location in my place. The salesman called some tech support folks @ T-Mobile; I explained my setup to them and they said that I should have no trouble using their hardware with my setup. They told me to plug the HiPort adapter box directly into my Ethernet hub, as opposed to setting it up between my cable modem and my Wingate computer. After I was told that I could bring everything back within two weeks (they call it the "buyer's remorse" period) I decided to give the system a try. The salesman programmed and installed a new SIM card (free) into the HiPort adapter, and I was on my way. When I got home, I tried setting up the HiPort home phone adapter by plugging it into my Ethernet hub, as instructed by the T-Mobile tech support folks. Didn't work. I then tried setting it up the way the instruction manual recommended -- hooking up the box between the cable modem and my router computer -- and, after I rebooted all my machines twice, including the cable modem, it worked. I was able to browse the web and make phone calls without any problems for about 6 hours. Then calls started breaking up and going dead, and my Internet became unbearably slow. I called up T-Mobile and, after running a few tests, they recommended that I go back to the cell phone store where I signed up for the VOIP service and upgrade my hardware to the Linksys WRTU54G-TM Wireless-G Broadband Router (with 2 Phone Ports!). They told me that I'd have to pay a fee for the upgrade, and I said no thanks! I ran my own tests, and found that the call quality and connection problems had nothing to do with T-Mobile or the HiPort hardware. The problem was with my Comcast broadband connection. Not too hard to figure this out. I pinged Yahoo.com from my Windows 2000 machine that's directly connected to my cable modem. With the Hiport adapter in the mix, the Time to Live (TTL) was OK, with an average round trip time of 49 milliseconds. But the connection would timeout quite often. When I removed the HiPort adapter and pinged Yahoo.com, I experienced the same timing out problem. I called Comcast and we went through all the possible causes for the timing out issue. Everything on my end was fine, so the tech support rep' recommended that I upgrade to a cable modem that supports the DOCSIS 3 standard (my D-Link modem uses DOCSIS 2.) He recommended that I get a modem from Comcast, but I declined that offer since renting from them would mean a monthly charge: a ripoff in the long term. He said that I could find a DOCSIS 3-compatible modem at Wal-Mart for less than $50. I thanked him for his counsel and ended the call. Next, I tried shutting down everything on my home network, which would reboot all my hardware. I included a visit to my fusebox and cut power to my home office, and I manually turned off my 3 uninterruptible power supply (UPS) devices (2 x APC and one TrippLite) to be sure that every ounce of juice drained from everything. After firing it all back up, my Internet was back to normal speed and the quality of the voice calls improved. and all has been OK since I rebooted everything in my home office. I called T-Mobile tech support again to see if I could somehow configure my HiPort adapter to prioritize my voice calls over the streaming of data. The support rep' told me that the HiPort adapter is already configured for voice priority. She said that even the T-Mobile @ Home service at her house has problems with voice calls sometimes, and it's always due traffic jams with the broadband connection provided by her Internet Service Provider (ISP). She said she uses a DSL connection to the Internet, provided by Quest. I can live with some lagging every once in a while. If I have an important call to make, I can simply shut down my router computer, or stop the Wingate service, or temporarily put the PC in standby mode, then bring the PC back online when I'm done with the call. I doubt I'll ever have to do this, but it's an option. Free Caller ID, voicemail, call waiting ID, voicemail to email, call log viewer, call forwarding, 3-way conference calling, E911, 611, 811 and 311 service. A close friend of mine uses Vonage and she is very happy with it. You get unlimited local and long distance calling to the USA, Canada and Puerto Rico @ $24.99 per month, whereas I'm paying $9.99 per month for my T-Mobile @ Home service. For my friend, Vonage makes sense because she has lots of friends and family in England, and with Vonage, unlimited calls to landline phones in the United Kingdom, France, Spain, Italy and Ireland are included at the $24.99 price point. If I called Europe often I might have chosen Vonage myself, but I don't, so going with T-Mobile @ Home made sense to me. First of all, I don't like the commercials. It's like that pitchman is trying to sell poisonous toys to preteens. The way he counts that money at the start of the commercial: like that's going to convince me to open my wallet? It's a low quality ad and it probably reflects either a low quality product, or low quality customer service, or both, in my opinion. It's like those "make money on the Internet" scams -- I mean "seminars." I attended one in New York City once, because I was curious and it was free. The whole thing was so stupid that I couldn't contain my laughter. Lots of "raise you hand if you want to make a lot of money" and "repeat after me: I am going to change my life, and work for myself, and make lots of money on the Internet, and it's all going to begin right here and right now," crap. All guff and no substance. I left after 3 minutes. Another thing about MagicJack: the hardware is a box that connects to your computer via USB. That's not practical, in my opinion, since I would have to leave my computer on all the time. Leaving my computers on 24/7 is something I used to do, but these days I'm in frugal mode, so I shut them down at night. If you're thinking about going for MagicJack, be sure to read all the comments at this USNews.com article. As with any VOIP service, if your Internet goes down, your phone goes down with it. If you do go for VOIP, be prepared for the worst. Buy a high quality uninterruptible power supply (UPS) and plug your cable/DSL modem power cord into it. You don't want to be in a situation where the power is out and you can't make an emergency call, especially if you have kids. And keep your cell phone charged. I have 3 UPS devices in my home office: two by American Power Conversion (APC) and one by TrippLite. I rank the APC devices above the TrippLite because they've been flawless in catching both major and minor brownouts, and blackouts. I don't like the idea of a two-year contract, but you can't signup for the T-Mobile @ Home service unless you commit to a two year deal. That's it for now. Hope this review was helpful. Comments are always welcome and appreciated. Over the years, I'm sure you've been told many times that you shouldn't rely on Social Security to take care of you when you are old, tired and done with working. Today's news from the Social Security Administration (SSA) seems to bear that out. "...The Social Security Board of Trustees today released its annual report on the financial health of the Social Security Trust Funds. The Trustees project that program costs will exceed tax revenues in 2016, one year sooner than projected in last year’s report. 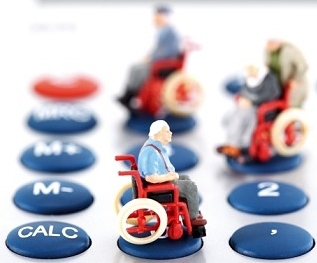 The combined assets of the Old-Age and Survivors, and Disability Insurance (OASDI) Trust Funds will be exhausted in 2037, four years sooner than projected last year. The worsening of the long-range outlook for the Social Security program is due primarily to the recent economic downturn and faster reductions in mortality than previously assumed..."